Award-winning organic hot ginger beer. Like your ginger beer drink hot and spicy? This one’ll warm you through to your toes. 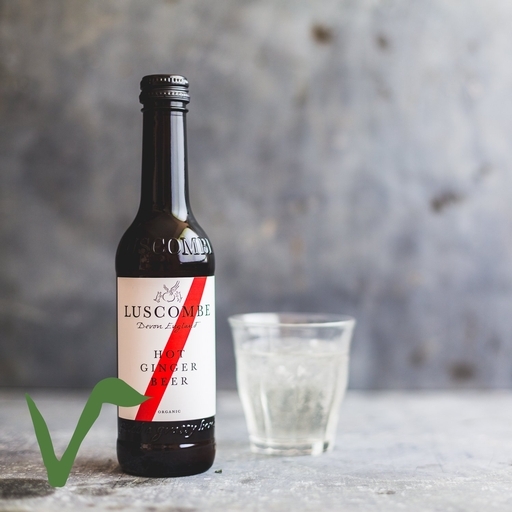 Luscombe make it with extra ginger for a punchy flavour. A beautiful match for chicken, pork or anything with a sweet glaze or marinade. Get 5% off when you buy a case of 24 here. Store in a cool place. Chill and tip twice to lift sediment before serving. Keep refrigerated once open. Spring water*, raw cane sugar, root ginger (3%), Sicilian lemon juice, brewer's yeast, lemon oil, CO2*.